Three evenings a week, I trek exactly 51 minutes from my house or 97 minutes from my office (depending on the day) to the University of West Florida campus in Pensacola for graduate classes in strategic communications. In 2018, I have set a goal of birding at least 15 minutes each and every day, which means I’m usually spending the last few moments of daylight before class wandering around the college buildings. One evening in particular felt a little blah. 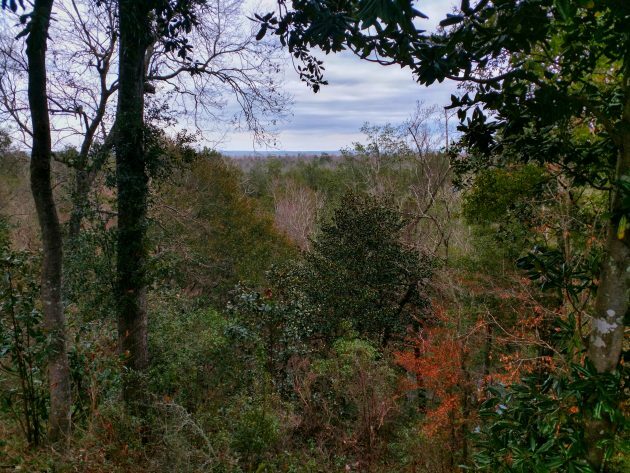 It was cloudy, rain threatened, and I saw little in the Southern Magnolias or Live Oaks other than Carolina Chickadees, Northern Cardinals, and Yellow-rumped Warblers. There’s nothing wrong with chickadees, cardinals, or butterbutts, but nearly every checklist I have submitted to eBird in January has at least one of these three species included, and I all but rolled my eyes as I sloppily noted their appearance in my field book. Not only did I think I had seen everything on campus, but also that there wasn’t much left to observe. Perhaps one of the best aspects of birding is that the activity tends to keep one humble. Even amazing birders make identification mistakes, and excellent avian trackers miss their desired species. In my case, a Summer Tanager made a mockery of my self-aggrandizing belief that I knew it all. I had an hour before class began to do an observational assignment in the College of Business building. I had been birding for about 25 minutes as I headed for the entrance, but still had my binoculars hanging from my neck. A bird erupted from the canopy, gliding downhill to a bare deciduous tree in between two structures. Its crimson plumage originally made me assume another cardinal, but I opted to take one last look in the binos before heading indoors. Amazing photo of a Summer Tanager (NOT). A gorgeous Summer Tanager appeared to stare back at me as I focused my sights, showcasing its red coloring clearly against the gray sky. While they are normally present in Northwest Florida during the summer, Summer Tanagers are supposed to spend the winter months in southern Mexico, Central, and South America. 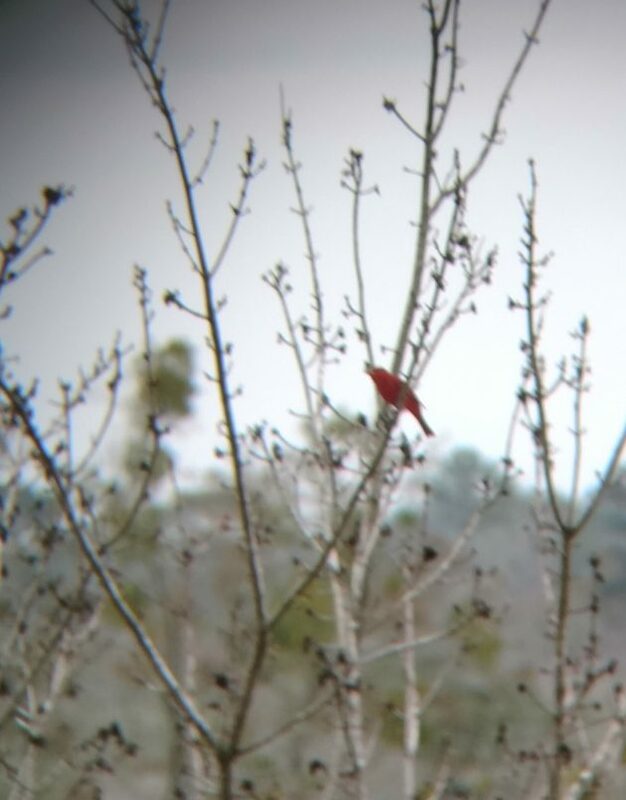 Given this, I precariously balanced my phone’s camera lens against one eyepiece of my binoculars, wiggling around until the tanager came into view. No, it was not a National Geographic-level image, but I did see enough to confirm my initial identification. I don’t see Summer Tanagers very often, and this one was a true treat. Next time I roll my eyes at the prospect of birding in a familiar, “boring” location, the tanager will be a glowing emblem of the beautiful surprises that await all birding enthusiasts. What a wonderful surprise! Thanks for sharing it with us, Erika. This is one of my favorite things about birding — you truly never know what you’re going to find (one of our CBCs in Philadelphia a few years back had a Wilson’s Warbler! ), and it’s mind-boggling to think of how many birds go unseen simply because someone wasn’t in the right place at the right time and, like you, looking. What Exactly is a Pardalote? Where Are You Birding This Second Weekend of August 2013? Where Are You Birding This Second Weekend of September 2016?